HAMPTON, Va. — Church was in session on a Thursday night. The Rev. Tom Potter didn’t let the microphone trouble bother him for the pre-race invocation at Langley Speedway. Once he found one that worked, the Motor Racing Outreach veteran belted out, “Lord, can you hear me? !” to a hearty laugh from the crowd. Divine intervention. Holy ground. 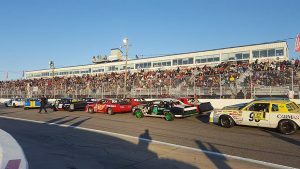 Whichever spiritual analogy suits, the Denny Hamlin Short Track Showdown brought a taste of big-time gospel to the grassroots level at the historic .396-mile track, a prelude to Saturday night’s NASCAR racing to the north at Richmond Raceway. Hamlin held on to win the 200-lap feature, which returned after a two-year hiatus with a first appearance at the Tidewater-area track. He fended off intense pressure from Busch and Norfolk wheelman C.E. Falk III over the final stage. Hamlin lent his name to the event but also his support, with all proceeds going to the Denny Hamlin Foundation, which funds research and therapy for cystic fibrosis. The mayor of Hampton declared Thursday as “Denny Hamlin Day” in a pre-race proclamation, but the event was less about pomp and circumstance than catching up with familiar faces at the site of Hamlin’s earliest successes, which include a Mini Stock Division championship at Langley in 1997. Here’s hoping it’s part of a trend. Kevin Harvick dipped into the NASCAR K&N Pro Series West earlier this season in his home state, casting a wider light on the developmental tour. And larger short-track shows have also attracted Monster Energy Series participants, amplifying the competition and the stature for both. For fans, there was plenty to see. Pressed against the catch-fencing during driver introductions, they weathered unseasonably chilly temperatures and a fierce wind, arriving early and staying late. Sellers says he’d like to see more of it — more incentives, bigger purses, stronger fields and a more intimate connection to the home-grown level of stock-car racing. Hamlin, for his part, indicated he’s in, hinting over the public-address system that the Short Track Showdown would likely return to Langley in 2019. On a night of congregation to benefit the sport’s roots, it was a fitting message worth preaching.